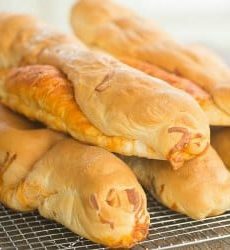 A staple here in western Pennsylvania, pepperoni bread (or pepperoni rolls) use frozen bread dough, sliced pepperoni and shredded mozzarella. Follow package instructions for thawing/rising frozen bread dough. Preheat oven to 350 degrees F. Line two baking sheets with parchment paper or a silicone baking mat; set aside. Cut each loaf of dough in half and work with one piece at a time, keeping the remaining pieces covered under plastic wrap that has been coated with non-stick cooking spray. Roll the dough into a thin rectangle about 7 inches by 12 inches. Cover the surface with sliced pepperoni, then sprinkle shredded mozzarella over top. Starting with a long side, roll the dough up tightly and pinch the seams and ends to seal. Place on the prepared baking sheet and repeat with remaining pieces of dough. Bake until golden brown, 35 to 45 minutes. Remove from the oven and allow to cool a bit before serving. The pepperoni rolls can be served warm or at room temperature. Store leftover pepperoni rolls in resealable plastic bags at room temperature or in the refrigerator for up to 5 days. The rolls can also be frozen, wrapped in plastic wrap and aluminum foil, for up to 1 month.